Pion Design love our retailers and want to let you learn more about them. Therefore we will be turning the spotlight on one of our stores every now and then, starting today with the amazing Bikuben. 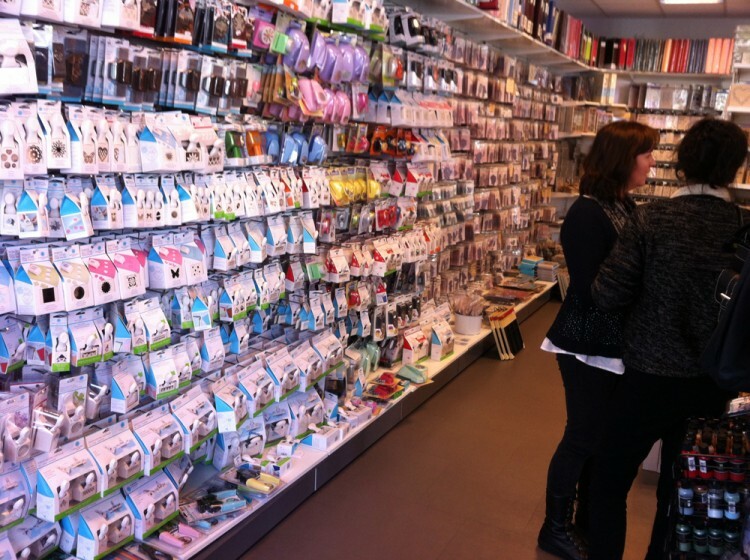 Bikuben is Norway’s largest scrapbooking store, and if you are ever in Strommen you certainly should pay Ellen Marie Santos and her staff a visit! 11½ years ago I opened Bikuben, a small shop specializing in gifts and interior products such as dried flowers, stamps, papers and card making utilities. At this time card making was a new and unknown hobby and I held courses in the evenings to attract the customers interest. After a few years scrapbooking came along and with the emerging interest for this hobby we decided to put all focus solely on scrapbooking . Having outgrown our space a few times, Bikuben is now a shop of 500 m², located in Strommen, close to Strommen Storsenter, Norway’s largest shopping center. Located 28 km outside Oslo the public transport to and from Strommen is well developed and if you arrive by car you are offered plenty of parking space. Today we are seven people working at Bikuben, and we make a great team! Many of our customers have stayed true throughout the years, and this is what makes having a store like this so rewarding . The customers are always kind and in good spirits since we are dealing with their hobby and something they are passionate about. During the summer we get a lot of visitors from far and wide, and I always enjoy meeting those who usually shop online. Two times a year I visit USA to shop for new products. Even though you can order most products online, I prefer to see and feel the products myself. This way I have come to meet a lot of new people, one of them being Tim Holtz. This winter Tim paid Bikuben a visit and afterwards Tim Holtz wrote in his blog: “I’ve been around the world and I’m telling you I have never seen anything like that store”. When we first started, all products came from USA. The last couple of years new producers of papers and stamps from Scandinavia has made it into the scrapbooking market. This way we are offered texts in Norwegian and Swedish, and the colours and patterns are designed for the Scandinavian market. Especially around the Christmas holiday the Scandinavian papers are a hit. Bikuben has been a retailer of Pion Design papers for a couple of years now, and they are very popular. We are also fortunate enough to have Anne Kristine Holt as a designer for Bikuben, and as a part of Pion Design’s Design Team, she creates the most adorable projects for us to keep in the store. With Norway being such a oblong country, it is quite a distance between the scrapbooking stores. In 2008 we opened up a web shop and it was a success! Now we are also able to ship to Sweden and Denmark. This year we started up a Facebook page and our own blog, so now you can follow us continuously even if you can’t make it to the store. In October Jenny and Theresa visited Bikuben together with Anne Kristine Holt, and this is Ellen herself opening the door into her fabulous store. Bikuben was a truly impressive store, all shelves packed with inspiring products. As a dream come true for all paper crafters and those passionate about scrapbooking! At Bikuben you can find papers from all of Pion Design’s collections. There were many customers visiting Bikuben, and Ellen her staff tried their best to help them with their questions and projects. 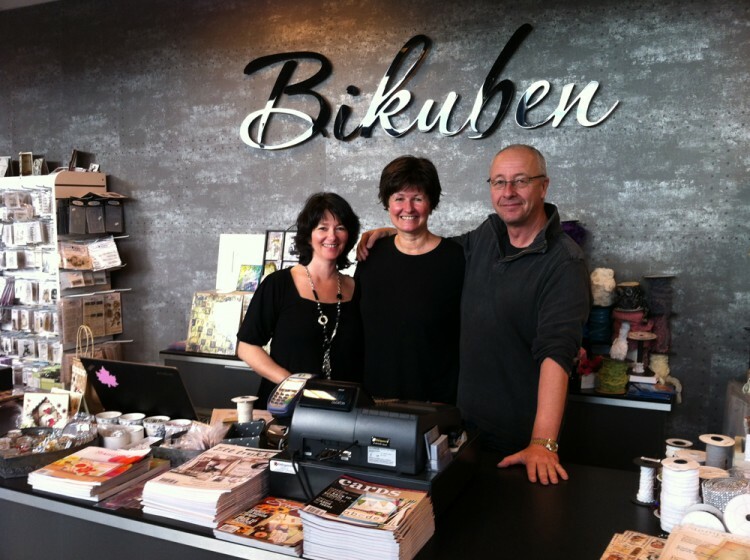 We want to say thank you to Ellen, Egil and the staff at Bikuben for taking the time to showing us their lovely store! Hope to be seeing you again soon! What a fantastic store, it would be a dream come true to walk through the doors of this beautiful shop, so many gorgeous products and wow! all those beautiful Pion papers, pure heaven. I am going to be coming to Oslo for a business conference in September 2014.I am also an avid scrapbooker and would love to see at least one Norwegian scrapbook store while I a there. I noticed you are not located in the city of Oslo. How long would it take to get to your store via public transportation and I am wondering if your store is open in the evening.